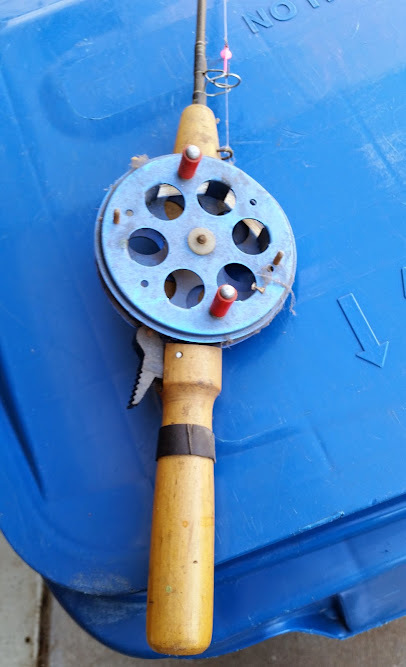 Post your questions and/or photos on vintage/antique ice fishing equipment in this thread. Has anyone ever seen a fishing box like this? I think it may be a kit box assembled from factory materials, either that or it's some fun folk art. I guess it to be late '50's or early 1960's from the quality of the plywood. The left side has two drawers and the right has a door. I note there is no place for a spud, or for fishing rod storage. It looks like the pipe runners and tow bar are hand fabricated. I hunted the net for a couple of hours and came up empty. Help? ?. I fish therefore I lie. Awesome idea for a Great Thread. 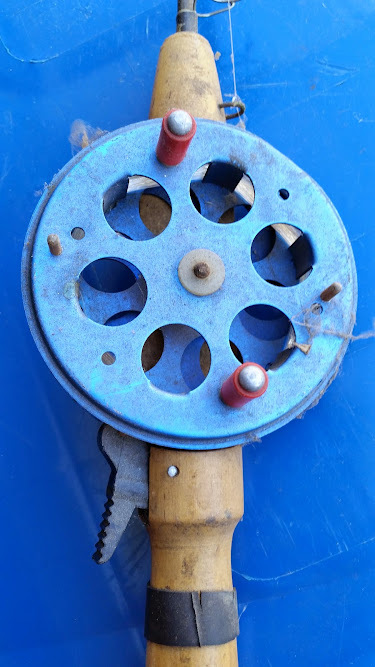 "Vintage and Antique Ice Fishing Equipment". I really look forward to what people turn up and can show us all. Thanks. Enjoy your day and all those around you. Tight lines for all. I bought this one about 30 years ago and just found it in a box of old tip-up stuff. It is in new condition. line (laying over the bend) is pulled from the spool the wire pivots and the lead weight slides down making the flag-up. Note the nice brass lug on the bottom of the main beam. 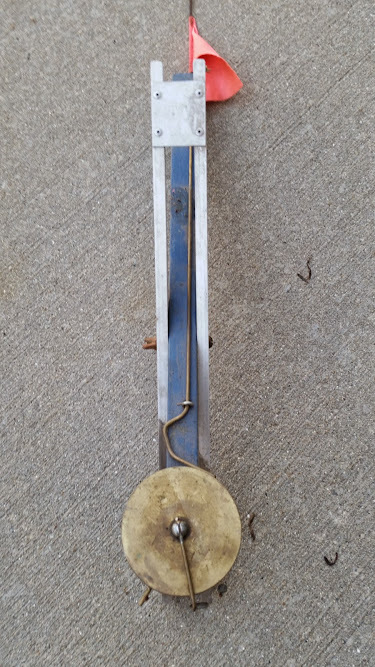 This lug is bent around the end and is pointed which sticks in the ice so the tip-down doesn't slide around. If there was a Ice-Fishing Museum I would donate it. sled I used to use as a kid. Cleaning out my fathers house and found these. and some of his homemade tip ups. Thus began my collection in the basement freezer." Cool find, wall mounters for sure. My son-in-law picked this up for me this Spring from a Yard sale. Very old Kit Kast Pole. I put the black tip on it, it is just a heat shrink for a spring bobber. Don't know if they ever got a patent but it say's Patent Pending on this rod. look both sides. Sorry nothing to do with ice. More Rods I picked up. 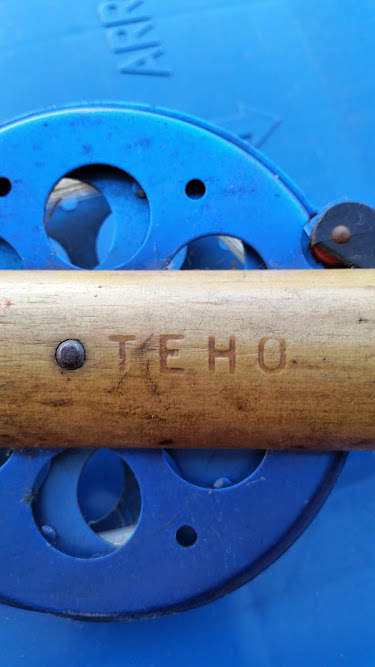 First is a Swisher Rod and the next is the ELO Normark . Both in fantastic condition. here is a old Swedish Spoon Auger. this was my father's. I remember him using it when I was really little. he later on got a 7 inch Mora auger then finally in 1990 he got his first and only gas auger. he passed away from cancer in December of 1993 and I ended up getting the gas auger and this Swedish spoon auger from my mother after his death. I have been temped to take out the spoon auger and try it out just to see how hard it is to drill a hole with it. If it is sharp, it cuts really good. Found this beauty at a antique store. Ice-Fisherman: We're all highly addicted, shivering, psychotic patients in the asylum of the frigid. Interesting thread, enjoying the pictures. Like looking at the older equipment. GREAT stuff. AWESOME idea for a thread!! wish I took pictures of my old shanty that I got out of my grandpa's garage. 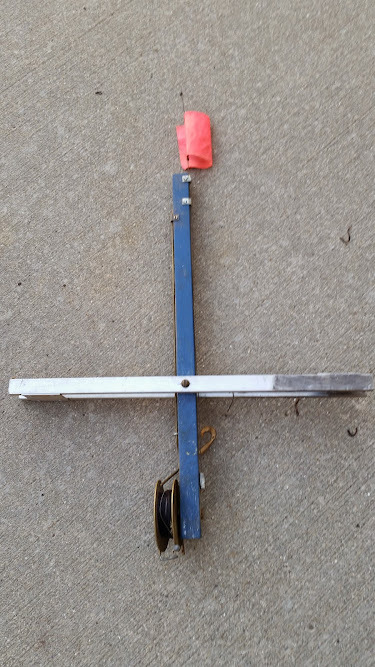 it was some steel tubing that had small cross-members that went together on the top via bolt/wingnut. then a canvas was draped inside the frame and hung with springs that had hooks attached to holes in the tubing, and tied to other areas of the tubing via sewn on straps. 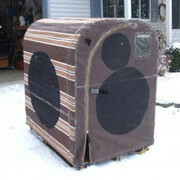 it was heavy as hell, hard to put up in a wind, but being a poor kid it sure beat being out in the elements. it was all drab green, looked very army-issued. That spoon auger made me laugh. First time I went out there was 14" of ice and we had a dull spoon auger. That thing was horrible. lol. Didn't take long to get an regular auger. I have a small spoon auger, probably the same make, and it is surprisingly easy to cut ice with it. One season I set aside my Mora and used my 4" spoon auger. Not as good as a Nils of course, but a decent auger. http://lazeysdailycup.blogspot.com/ - About tea, ice fishing and being raised by cats. If you let a cat help you put line on your tipup... It will take twice as long and wear out your line. But the cat will be entertained. I remember using a spoon auger- when it was sharp, it cut so fast, it shaved the ice around the edge of the hole, but cut baseball sized ice chunks out of the center. It was the devil to keep sharp, but seemed to cut faster then helical augers when it was. Living in Arctic North West Alaska. One can find both the new and old ways on the same piece of ice. 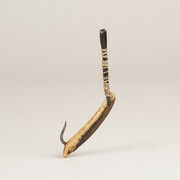 I sometimes see a ivory Siifish hook used, carved ivory body, steel hook and a sinue wrapped baileen bail. Some times one will see a caribou antler Taaq ice chisel. Now days they rather use 110 lb spider line than sinue cordage.